Ever since the Italian Renaissance, artists the world over have gone to Florence to admire its treasures and study the work of its masters. Within the walls of the Uffizi, you can view many of the masterpieces of Italian art in one of the world&#146;s greatest public museums. The collection includes a comprehensive collection of Italian painting, along with a large collection of classical Roman Sculpture. There are important collections of drawings and northern European painting, among others. The building was originally designed to be a suite of offices. 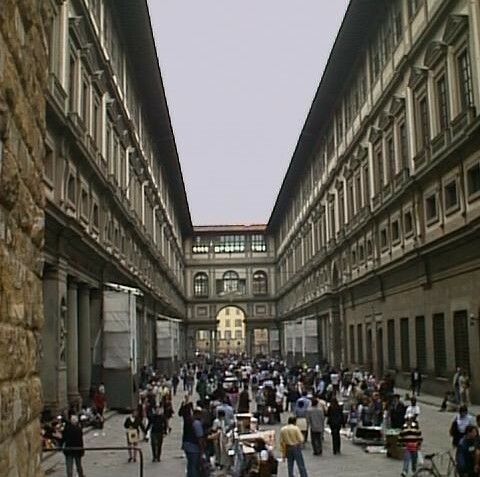 It forms three sides of a long narrow plaza off the Palazzo Vecchio and runs to the Arno River. It is in typical Renaissance style, with three floors of ascending window frame styles facing the square. Inside you are greeted by marble floors and halls flooded with light from the facing windows. The interiors include elaborate ceilings recalling the wall decorations of Pompeii. Many of these frescos are by Vasari and date from the late 16th century. The sculpture collection is housed along the main corridors that run the length of the building. Roman portraiture is particularly well represented. You can look into the eyes of Trajan, or remark about Roman hairstyles. Many of the statues we know from ancient Greece are also represented here in Roman copies. The corridors are decorated with grotesques copied from Roman grottoes and naturally lit by the windows facing the square. The main collection includes great works by Giotto, Massaccio, Filippo Lippi, Botticelli, da Vinci, Bellini, Giorgione, Titian, Michalangelo, Raphael, and just about every great Italian artist through the 18th century. The core of the collection is from the Medici court. The collection has remained remarkably intact with few changes over the centuries. Viewing it is like watching the history of Italian art unfold before your eyes. The Uffizi is small enough to visit in a few hours time. If you are tired from waiting in line, my advice is to take a break at the terrace cafe. The service is excellent and it offers a beautiful view of the Piazza della Signoria. In the rooms that have been modernized, you will find excellent lighting. In many of the older rooms, you may find that the lighting is not optimal. Since the interiors themselves are great works of art, it is easy to forgive the museum for not compromising them to modern conveniences. For travelers bound for Florence, my advice is to stop by the Uffizi early during your stay. The lines can be very grueling, sometimes taking 2 to 3 hours. The office will sell you tickets for a scheduled time reducing your wait to approximately 30 minutes. If you cannot do that, arrive as close to opening as possible. Another reason to check with the museum is that some rooms are not open every day. The Uffizi is one of the best places to visit if you want to truly appreciate the evolution of painting. The works are mostly arranged in historical sequence. Moving from room to room you can see how painting evolved from Byzantine and medieval beginnings through the Baroque. In many of the early works, you can see the Byzantine influence in the use of line to suggest drapery and the heavy use of gold leaf. The artists of Sienna soon begin to change this style by making more delicate use of line and suggesting three-dimensional architecture even before the discovery of formal perspective. Soon the revolutionary Giotto appears on the scene depicting rounded solid figures that seem almost like Doric columns. As the Italian artists learn to represent objects more naturally, they also begin to absorb other influences. The international Gothic style soon exerts its influence. In this style the spatial depth is pushed back and the scenes crowded with multitudes of figures in elaborate and colorful costumes. In spite of this, the overall trend in Italian art is towards the austere. The artists give the human figure a more sculptural appearance and the space is simplified and made more logical. Around 1424, the discovery of mathematical perspective causes yet another revolution in style as artists vie for more and more realistic representations of figures in space. The 15th century ushers in the early Renaissance. Artists have new theories and improved materials. There is a great deal of experimentation with various stylistic elements. The Medici themselves played a role in this revolution by commissioning many of the works found in the Uffizi. Two of the masterpieces of the Uffizi come from this period. The Birth of Venus and the Primavera by Botticelli make us marvel at the artistic mind that could conceive such fantastic compositions. The paintings are unbelievably rich in detail and must be seen in person to be appreciated. There are many examples of High Renaissance works in the collection. Among them is the Annunciation by Leonardo da Vinci, the Madonna of the Goldfinch by Raphael and the Holy Family by Michelangelo. These paintings are not only a synthesis of the styles and techniques that came before; they glow with the inspiration of a golden age. There are also excellent examples of Venetian art from the period, including two important paintings by Titian, The Venus of Urbino and Flora. Our sense of composition and beauty today owes much to the masters of this period. As always, art is influenced by fashion. Soon there was a movement towards the elongated figures of the Mannerist style as in the works of Tintoretto. And towards the end of the 16th century Caravaggio had a profound impact on the art world with his realism and intense use of shadow and light. These changes ushered in the Baroque period. The Uffizi collection includes many masters of this period from Northern Europe, including Van Dyck, Rubens and Rembrandt. Finally, the collection contains a number of 18th century works that show the artistic trend towards genre scenes and courtly life. From this period there are many French works including Watteau, Boucher and Chardin. The Uffizi collection is both a delight to behold and a concentrated educational experience. For the lover of art history, it is an essential destination. Make it a top priority on your itinerary.